how does gene garber spell relief? e-m-u! gene garber fulfilled my recent ttm request, and i received my 1978 topps card back in the mail today. here's the link for you, so you can check his site out for yourself. apparently emu oil is an ancient aboriginal secret. maybe this is a sign - i should call mickey and buy a ticket to fly to pennsylvania and visit the garber emu farm. like clayton, the slack jawed yokel! have a good (and safe) weekend, everybody! these cards have seen better days, but when it comes to 1971 and especially the high numbers, i am taking what i can get. 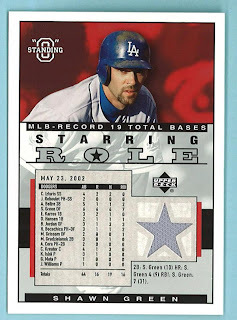 between sheffield, kevin brown, and shawn green there were millions of dodger cards issued in 2000. millions. i am sure of it. here's a 1993 score select eric davis that jim also included. 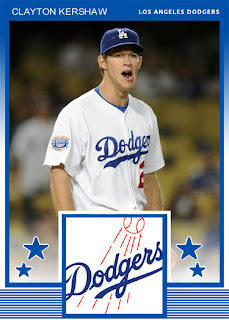 did you know that davis sucked as a dodger? i did. in hindsight i should have scanned the back of the card so you could see his lowly stats, as well as the intricate design he shaved into the side of his head and his 'e' earring. by the way, where's dougie now? thanks jim. i am going to take a closer look at your want lists and see if i can do some more damage. here's another one of my favorite cards - it's the 1992 topps tom lasorda card. lasorda, who was in the midst of his slim fast ways and still using his feet rather than a golf cart to get around, is surrounded by a litany of dodger lurkers. gary carter, kevin gross, john candelaria, orel hershiser and bobby ojeda. with all of those pitchers, there are a total of 638 career victories accounted for on this card. lasorda, of course, contributes 0 to that total. at least he's one of the two hall of famers featured. here's to you, 1992 topps tom lasorda (with all of your background lurkers) - you're perfection on cardboard! mike sharperson died in a car accident 14 years ago today. he was on his way to san diego to catch a flight to montreal so that he could join the padres for the first time. let's celebrate his 1991 upper deck card, which i think is perfect. i'm not sure exactly which game the photo is from, but regardless, this card is one of my favorites. it captures a beautiful southern california day in dodger stadium, with the bright home whites on full display, the field level scoreboard, a tiny bit of the yellow of the seats peeking through, and most of all, the almost fulfilled, full of anticipation, mid-air status of sharperson as he is about to score a run. there is hope in the photo. acquired from the blue jays in 1987 for pitcher juan guzman, sharperson was a member of the dodgers' 1988 world championship team. although he didn't appear in the world series, he did have two plate appearances in the nlcs, including a bases loaded pinch-hit walk against randy myers in game 3. sharperson played all over the infield, and in 1990 he set career highs in games played, hits and stolen bases. two years later, in 1992, sharperson was the dodgers' lone all star rep in what turned out to be their worst season ever. as a free agent following the 1993 season, sharperson re-signed with the dodgers but was released just before the start of the 1994 season. he then signed with boston but was released before making it back to the big leagues. he signed with the cubs a few days later and that relationship ended with the same result as his time with the red sox. the braves signed him for the 1995 season, and on may 5 he returned to the majors. he had just one hit (a 2-run double) in his 7 games with the braves and was released at the end of the season. the padres signed him late that fall, and he was playing for their aaa team in las vegas when he got the call to report. a witness to the crash said that sharperson failed to negotiate a turn and wound up in the median. not wearing a seatbelt, sharperson was ejected from the car and died a short time later. here's to you, mike sharperson, and your 1991 upper deck card - perfection on cardboard! as pretty much everyone knows by now, former dodger jose lima died last weekend of a heart attack. he was only 37 years old. here's the gold parallel version of his 2004 topps traded card. he played for the dodgers for just one season, but it was a good one. in 2004 lima won 13 games (the most he had won since his 21 win season in 1999 with the astros) and was slated to pitch in game 3 of the nlds against the cardinals. the dodgers had lost the first two games of the series, both by the score of 8-3 and looked to be headed home for the winter in their third consecutive postseason sweep. but that wasn't going to happen during lima time. lima threw a 5 hit shutout, shawn green hit 2 home runs, and the dodgers lived to fight another day. even though they lost the next game, lima had given us fans hope. he gave us hope, he entertained us, and he seemed to live his life happily. i am sure he will be missed. the picture used for the 2010 goose joak original shown above was taken at dodger stadium on friday night, just a day and a half before he died. here's to you jose lima! in 2000, the prodigal son returned. orel hershiser, the bulldog, the man who pitched the dodgers to a championship in 1988, had been allowed to leave los angeles as a free agent after the strike shortened 1994 season. some complained at the time that hershiser had become a .500 pitcher, but they were ignoring the lack of run support he received from the dodgers of the early 90's. while he posted win-loss records of .500 (or worse), his era remained below 4 (except for his abbreviated 1991 season wherein he was pitching without a rotator cuff). at any rate, he landed in cleveland where he promptly continued his postseason dominance against the red sox in the alds, the mariners in the alcs, and even the braves in the world series (although he lost game 1). after three decent years in cleveland (his win-loss record somewhat masked his climbing era) and two world series appearances, hershiser again became a free agent, and decided to return to the nl west. the giants were happy to have him, as he won 11 games and pitched 202 innings for them, despite a 4.41 era. for the 1999 season, hershiser signed as a free agent with the indians. however, the tribe released him during spring training and the mets picked him up. he pitched his final full season with new york that year, winning 13 games including the 200th of his career. he also tallied his 2000th career strikeout. in the playoffs, he appeared exclusively in relief, throwing 5 and a third scoreless innings to reduce his career postseason era to 2.59 with a 1.11 whip in 132 innings. not too shabby. the 2000 dodgers were in need of pitching. they had traded ismael valdes to the cubs, so after kevin brown and chan ho park, they were looking at darren dreifort and carlos perez and a bunch of rookies (including luke prokopec and eric gagne) to round out the rotation. 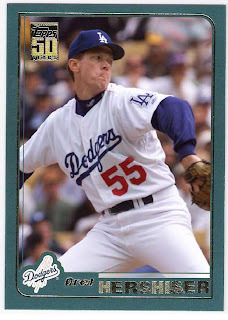 hershiser was signed as a veteran arm who had been surprisingly durable since his rotator cuff injury, having pitched at least 167 innings since his departure from the dodgers. he was inserted as the team's number 3 starter, and was hit hard in the first inning of his first start on the way to a four run, five inning performance. nine days later, hershiser was tabbed as the starter for the dodgers' home opener, and just as he had done in 1994, he didn't disappoint the opening day crowd. hershiser went 6 innings, giving up one run, and earned the win as the dodgers beat the reds. it would be the final victory of hershiser's career. he started 4 more games, losing all of them, and was released after allowing 8 runs (5 of which were driven in by bret boone) in the second inning of a game against the padres. it was actually pretty easy to find a picture of hershiser from 2000 (thanks la times) to use, but the 2001 topps template is tough to work with. i think it came out ok, though. here's to you bulldog and your card that should have been! 2004 fleer ultra hee seop choi. i was really hoping hee seop would break out with the dodgers. he had too big of a swing, i think, and jim tracy didn't seem to care for him. anyway, this is a nice card (hello dodger stadium!) of the big south korean whose presence forced mark grace out of chicago. 2006 was gagne's final year in la. he pitched in just two games for the dodgers, having been injured for and out of action for about a year. in those two games, he gave up no runs or hits and struck out 3 in 2 innings of work. he also earned a save in his final dodger appearance. unfortunately, that was june of 2006, and he went back on the dl and out of the dodgers' plans for 2007.
man, fleer had a lot of different sets in the early 2000's. focus, authentic, tradition, ultra, box score, greats, platinum, genuine, and the list goes on. i don't know that i had ever seen fleer inscribed before. there were a bunch of 2007 upper deck cards, too. i know night owl doesn't care for them, but i think they're pretty cool. here's marlon anderson (one of the 4+1 home run guys) in a rare dodger card appearance. 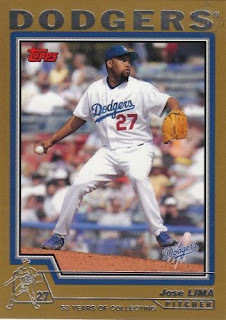 he actually appeared in 41 games for the dodgers in 2007 and is currently with the phillies. i am thankful for the dessens card seeing as how it is 99% a dodger card that would never have been on my radar. sometimes there's more than just stats on the back! imagine if you will a boy pestering his father to schedule a family road trip to los angeles that coincides with baseball card night at dodger stadium. imagine that the child succeeds, and arrives at the stadium with a sibling who doesn't give two cents about baseball cards, but receives them because they are under 14. imagine this boy now having two sets of dodger police cards. man, was i stoked. not even the fact that these sets, started in 1980, were oversized could really dampen my excitement. all three feature dodger stadium in the background, and the scioscia is somewhat reminiscent of that great 1976 topps johnny bench card - the catcher as victorious gladiator as the dust settles around home plate. ...to witness one of the greatest individual offensive achievements in baseball history. shawn green went 6 for 6, with 5 extra base hits, 4 home runs, 19 total bases. he also scored 6 times and drove in 7 in the dodgers' 16-3 romp over the brew crew. i remember going nuts when adrian beltre hit his two-out homerun in the top of the 9th, giving green another shot at hitting a 4th homerun (green had singled in his 5th at bat). and then, when green actually connected it was just unbelievable. somewhere i have the scorecard that i kept along with the ticket stub and all of that, but these cards are just as helpful in reminding me of what a great performance i witnessed eight years ago today. here's to you shawn green! he's 67 today, if i did my math right. here's his 1976 o-pee-chee card that was the last one i needed for my team set. it's a great card in that it features dodger stadium with the original seats (the club level were switched to a brighter orange in the first renovation) and that john was featured in the 1976 set even though he spent all of 1975 on the disabled list rehabbing from his innovative ligament replacement surgery. would he have won 12 games in 1975 to give him 300 in his career? maybe the better question is would he have won 288 games in his career without the injury and surgery? happy birthday either way tommy! the photo selection and the fact that the info box on this 1996 donruss kevin tapani card scans darkly, along with where it is placed, makes me wonder if there was a wardrobe malfunction that needed to be obscured. it's kind of an awkward card. but, it's one of the few to feature tapani in a dodger uniform, so that means it's one of the ones i sent to him as part of a ttm request last summer. tapani's dearth of dodger cards results from his short stay in la. he was acquired in 1995 at the trading deadline from the twins, and then signed with the white sox after the season was over. for whatever reason, tapani wasn't included in the 1995 topps traded set, nor was he featured as a dodger in the 1996 flagship set. that background looks an awful lot like dodger stadium, but there was no interleague play prior to 1995, and i think the pre-season games at dodger stadium were still exclusively dodger/angel matchups back then. at any rate, i am glad to have these cards in my ttm collection. are going 'norma rae' on us. it will be interesting to see how ryan deals with any labor strife since he's on the other side of the fence now. boog powell through the mail success! i was feeling optimistic last summer when i sent boog powell a ttm auto request. i included my typical short note and sase along with a 1978 topps dodgers team card (featuring boog in the second row next to the short guy in the suit). i also threw in his 1976 topps card for fun. what i didn't realize was that boog signed just one card per request. no big deal, i waited a while and re-sent the 1978 card. several months went by. finally, i got my card back, but it was unsigned. along with it was a note stating that boog was too busy to respond to all of the requests he was receiving, but that a shop in baltimore would be hosting a boog signing in april of 2010.
this is the second 1978 topps custom i have had signed (vin scully is the other) and the third one i have sent out (al downing declined). i am hoping to get a few more printed up and signed. since i already have a team card signed by red adams and another one by mark cresse, i don't count this as another card in my modest 1978 topps dodgers autograph project, but here's the tally anyway. team card (red adams) - through the mail success! team card (mark cresse) - through the mail success! team card (boog powell) - through the mail success! dusty baker - through the mail success! ron cey - through the mail success! vic davalillo - ebay success! terry forster - ebay success! mike garman - through the mail success! steve garvey - through the mail success! jerry grote - through the mail success! burt hooton - through the mail success! charlie hough - through the mail success! tommy john - in person/through the mail success! lee lacy - through the mail success! tom lasorda - ebay success! dave lopes - through the mail success! ted martinez - ebay success! rick monday - in person/through the mail success! manny mota - through the mail success! johnny oates - ebay success! doug rau - through the mail success! lance rautzhan - through the mail success! bill russell - through the mail success! reggie smith - through the mail success! elias sosa - through the mail success! don sutton - through the mail success! steve yeager - ebay success! nlcs (davey lopes) - through the mail success! thanks boog! and be sure to check out the dugoutzone. there's a brooks robinson signing coming up in october! here is a 1974 jerry morales card. i ask the question, is it topps or o-pee-chee? jerry was 'traded to chicago cubs, 11-12-73'. this actually was not too strange for topps, although they did it a lot more in the 60's, with and without cropping to minimize the amount of the players' old uniform showing. of course, airbrushing was far more prevalent in the 70's, but for whatever reason, they left jerry morales alone in his brown and yellow padres garb. 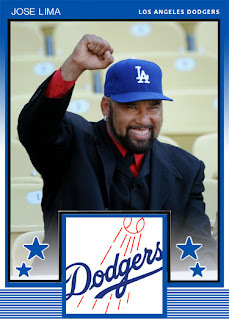 it would be nice to know how topps decided whether to airbrush or do the jerry morales treatment, or just go the text route like the 1988 dickie noles card linked above or the 1985 davey lopes, or worse yet do nothing at all. 6 years later, topps would choose that route for ralph garr, even though he actually played for his new club at the end of the 1979 season. go figure. what if there were short prints in 1981 topps? get well soon dave roberts! terry forster ebay auto success! where have you gone, dougie baseball?